This circuit is a really simple EM field detector, that works best for frequencies less than a few hundred MHz. A germanium diode is used to allow for weaker signal detection. It is only comprised of 4 parts and an antenna! 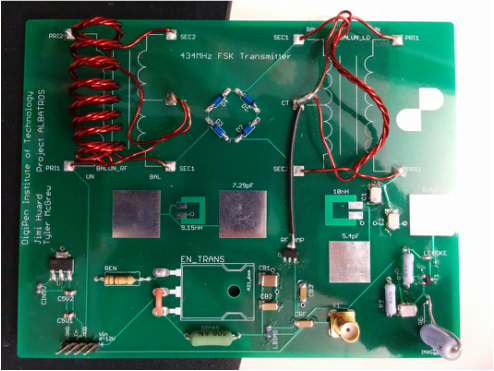 The main goal of this project was to learn about RF circuitry and theory. To do so, I decided to design and build a 434MHz frequency shift keying transmitter. As I started with a limited knowledge of RF circuitry, there are significant places for improvement of the design. It is driven by a simple Colpitts oscillator, which is then mixed with an input modulating signal through a diode-ring mixer, using the center tap of two baluns to produce the intermediate frequency. This is low-pass filtered (to remove the higher of the two mixed terms), and then power amplified. The schematic can be seen below.